The magnificent southern sky is a starry realm richly sown with a treasury of deep-sky objects: star clusters, bright and dark gas clouds, and galaxies. From this (sometimes bewildering) array five specimens of each class of object have been selected by a special Deep-Sky Task Force and are presented here as the celestial Big Five. The representative of open star clusters is the Southern Pleiades. 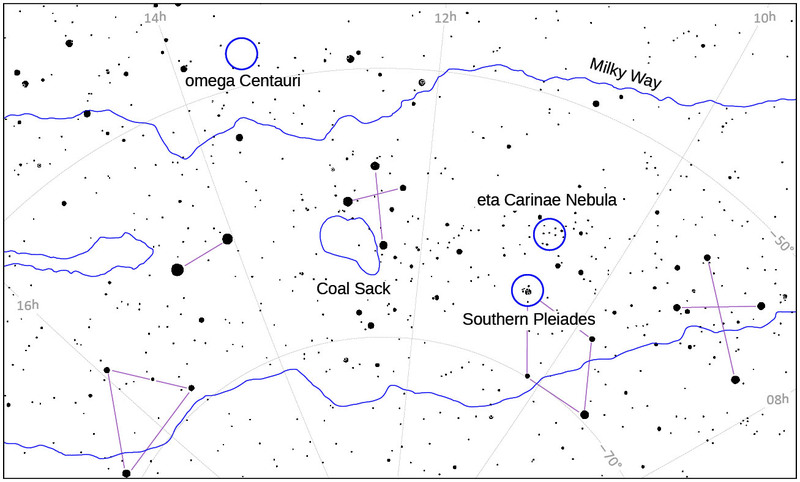 First amongst the globular star clusters is the overwhelming omega Centauri. Bright nebulae are represented by the majestic eta Carinae Nebula. The mysterious dark nebulae are represented by the Coal Sack. And the most splendid galaxy of them all is our own Milky Way Galaxy. Your mission is to observe each of these beautiful objects and report back on what you have witnessed. All submitted observations will be carefully evaluated and feedback will be given. The names of all participants will be acknowledged on the ASSA website. Observing certificates will be awarded only on merit and are issued by the Deep-Sky Section of the Astronomical Society. Have fun, and keep looking up! 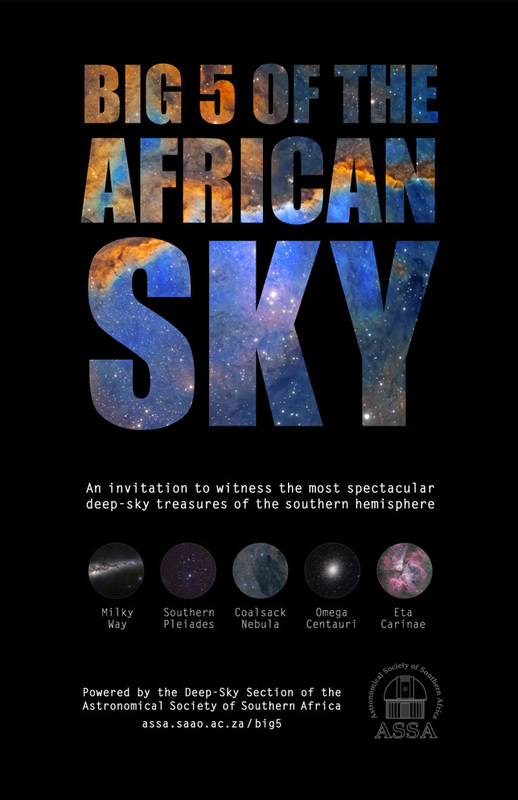 The Big 5 of the African Sky are five celestial objects that represent the best specimens of each type of deep-sky class: the Southern Pleaides (an open star cluster), omega Centauri (a globular cluster), the eta Carinae Nebula (a bright nebula), the Coal Sack (a dark nebula), and the Milky Way (a galaxy). Where can I see the Big 5? The Big 5 are visible anywhere from within the southern hemisphere. Two of the Big 5 lie in Carina, one lies in Centaurus, and one in Crux. The fifth – the Milky Way – lies in a narrow band dividing the sky in half. The brightest parts of the Milky Way are in Sagittarius, Scutum, Norma and Carina. The accompanying table gives their celestial coordinates and basic data. Two star maps illustrate their general location, with one map devoted specifically to the Milky Way. † The Milky Way circles the entire sky so a single position cannot represent it. The last five rows of the table lists the positions of the five brightest portions. The Galactic centre is in Sagittarius. When can I see the Big 5? All five objects will not be visible at the same time. This is mainly because the Milky Way is a large object and it will take more than one session to see it at its full extent. 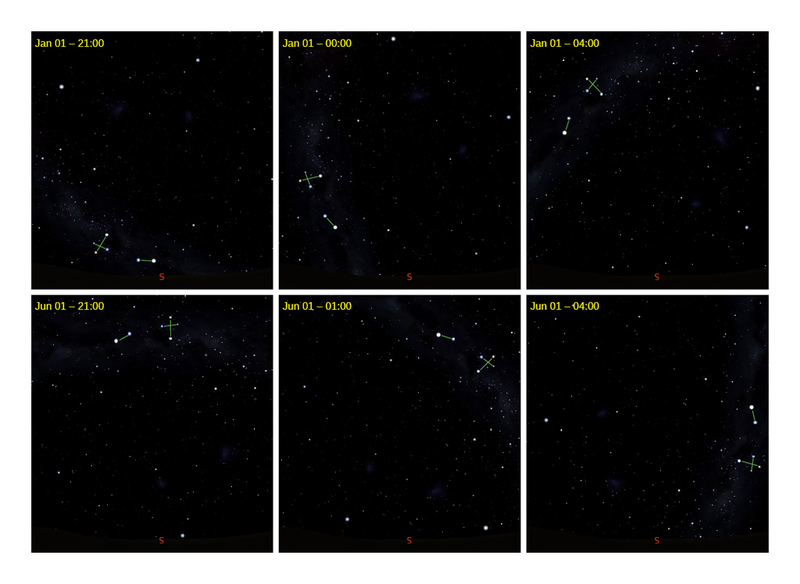 There are a number of tools you can use to find out when a particular region of sky is visible. You could, for example, use the Southern Star Wheel planisphere, a free DIY download. Your favourite planetarium program (e.g. “Stellarium”) or app (e.g. “Google Sky Map”, “Sky Safari”) are also great options. 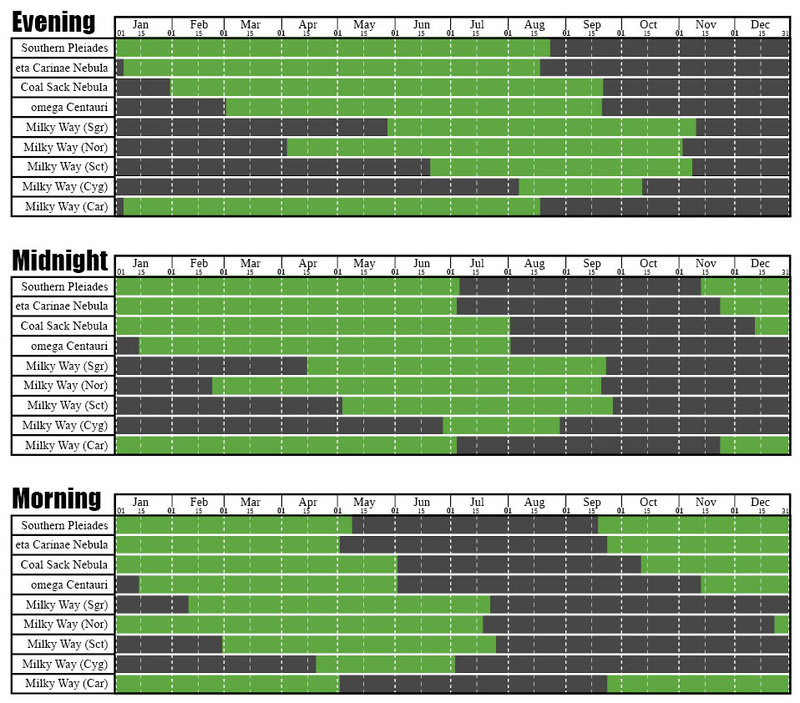 The following table gives a general indication of when the Big 5 can be seen. By noting how the position of Crux (the Southern Cross) changes throughout a night, and over the course of a year, the location of the Big 5 can be determined quite easily. How do I see the Big 5? Once you know where the Big 5 are and when they are visible, decide on what equipment you would like to use. The Big 5 can be seen with the naked eye alone if you observe from a dark-sky site. Under these conditions the Milky Way in particular is a spectacular sight. If you will be observing under suburban skies you will need to use at least a pair of binoculars. A telescope will, of course, show the objects more easily, but the large size of the Milky Way means that most telescopes are too “powerful” – use binoculars instead. How do I record the Big 5? For each object, write a clear description of what you see. Imagine explaining the view to a blind friend who knows nothing about astronomy. Sometimes making a rough sketch, too, is a good idea. Also write up a few lines (like a diary entry or a blog post) telling about your observing experience. This journal is a great way to capture your thoughts and feelings of the moment: you’ll enjoy reading it a few years down the line! How do I report my observations? Collect your observations of each object, add your observing journal entries (and sketches if you made them) and submit them to the ASSA Deep-Sky Section. The easiest way is to send an e-mail to the Section Director, Auke Slotegraaf. 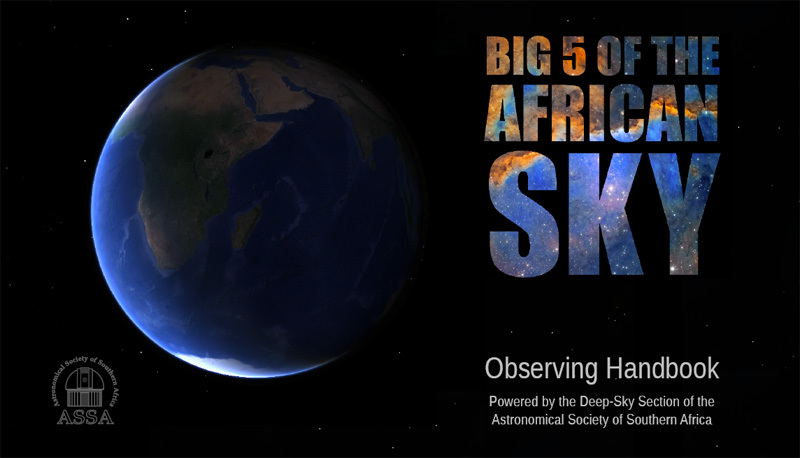 A great idea is to share your observations with other observers: you can post your notes on the Big 5 Facebook Group and on the ASSA Deep-Sky Section YahooGroup mailing list. What happens after I submit my observations? 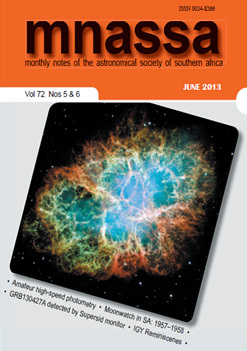 All reports will receive feedback from the ASSA Deep-Sky Section. If you’ve successfully observed the Big 5, your name will be listed on the ASSA website Big 5 Honour Roll. You will also be issued with a virtual sticker – a graphic that is created uniquely for you, officially hosted on the ASSA website, that you can link to and embed in online media. 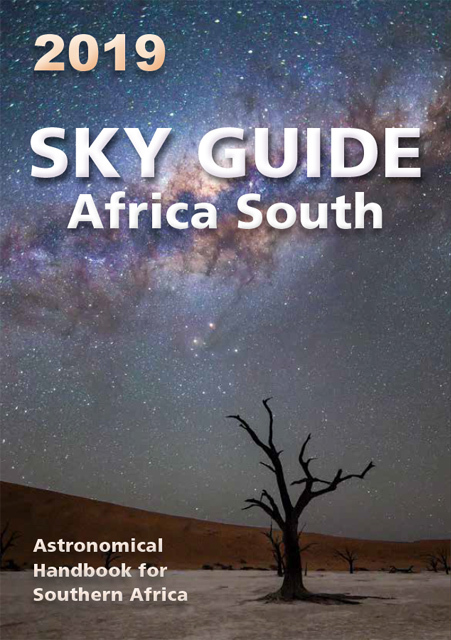 In addition, extracts of your descriptions and journal will be published on the ASSA Deep-Sky Section webpages for other observers to read and enjoy. What about the Big 5 Bling I’ve heard about? 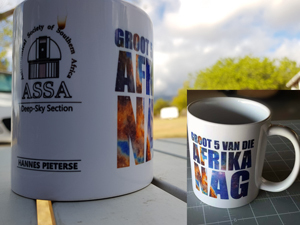 Once you’ve successfully observed the Big 5, you are eligible to buy a beautiful Big 5 of the African Sky mug – personalized nogal! A handsome T-shirt is also available, to keep you warm and stylish, and to proudly show off what you’ve achieved! We’re still finalizing the selection of the best suppliers, but the mugs should cost R80 and the T-shirt R200. Postage (via PostNet) costs R99.